On September 24, a video surfaced that appears to show UTSC psychology professor Steve Joordens playing a pornographic video on the projector screen by accident. The incident, which apparently took place at the start of the lecture, was recorded by one of the students in the class via a Snapchat video and subsequently posted onto Reddit, where, along with many memes made about the event, it instantly went viral. “When I saw the [pornographic] video, I was surprised,” the original poster, a first-year student studying Philosophy, wrote to The Varsity. The class, which was reportedly PSYA01 — Introduction to Biological and Cognitive Psychology, had about 500 students in the lecture hall. As seen in the video posted by the student, many students in the class were laughing, though others could be seen walking out of the room. Don Campbell, Media Relations Officer at UTSC, told The Varsity in a statement that the university is aware of the incident and are looking into it, but that they can’t discuss personnel matters. “We encourage students who may be feeling unsettled by the incident to speak with their registrar or staff at the Health & Wellness Centre,“ Campbell said. Joordens started teaching at UTSC in 1995. Since then, he has won numerous teaching awards including the Canadian Post-Secondary #EdTech Professor of the Year in 2017 and the 3M National Teaching Fellowship in 2015. Editor’s Note (September 25, 2:10pm): This article has been updated to include a statement from UTSC. Editor’s Note (September 28, 12:20pm): This article has been updated to include a statement from Joordens. I am sitting at my maternal grandmother’s house in New Delhi, India. Masi, my aunt, has prepared a dish for me that she promises I will love. I don’t particularly like surprises, but I wait outside the kitchen. I catch a whiff of something sweet. I can’t place it but it’s familiar. I close my eyes and I know it’s a smell from my childhood. Then it hits me. My Masi is making an Indian confection called almond halwa using my grandmother’s recipe. This connection that I made — that we all make — between odour and memories, is explained in a study published in Nature Communications. The study, led by Afif J. Aqrabawi, a PhD candidate in the Department of Cell & Systems Biology at U of T, sheds light on this connection and how it could help develop new diagnostic tests for Alzheimer’s disease. The hippocampus (HPC) is essential to episodic memory. It organizes memories of sensory events, including smell, in terms of space and time. The HPC stores the condition of the brain when said events take place, and then retrieves and recreates cerebral cortex activity of the original memory’s context when we encounter the sensation again. The anterior olfactory nucleus (AON) is the largest source of feedback projections in the olfactory cortex, and the anatomical junction where the connection between olfactory and contextual information is made. HPC projections into the AON can alter the way smells are perceived and what behaviours are associated with specific odours. Aqrabawi and Department of Psychology Professor Jun Chul Kim had determined that inputs from the HPC to the AON are necessary for the retrieval of odour memory based on spatial and temporal contexts. They knew the AON played a role in connecting spatial and olfactory events, but they did not know the exact function of the AON-HPC junction. Thereafter, Aqrabawi and Kim found a neural pathway between the HPC and AON and they were able to define its role in memory retrieval. This pathway is responsible for contextual retrieval of odours and is affected in patients with Alzheimer’s. In the study, mice whose AON-HPC junction was blocked kept returning to investigate the same scent even after being exposed to it several times prior. This was an indication that the AON plays a significant role in memory retrieval. On the other hand, mice whose junctions were left to function normally spent less time smelling familiar odours because of the episodic memories associated with them. Inhibition of the HPC-AON pathway results in a loss of the odour memory linked to a given context in space and time. This is the first study that demonstrates that inputs from the HPC to the olfactory cortex are necessary for forming and retrieving episodic odour memories. Findings from the study also show that the anatomical location of AON behind the olfactory bulb is an ideal bridge between olfactory and contextual information. Multiple studies have reported a loss of olfactory function in Alzheimer’s patients. In fact, diagnostic smell tests are currently used to detect the earliest symptoms of the disease. This olfactory dysfunction is due to the neurodegeneration of the AON, which stores episodic odour engrams, during the early stages of Alzheimer’s disease. Future research involving these findings will likely aim to better understand the connection between smell and memory, and particularly the neural circuits involved in this association. A new study by U of T PhD Student Ping Dong and Assistant Professor Spike W. S. Lee posits that hand wipes may be used for more than on-the-go cleaning. Their research, published in the Journal of Experimental Psychology earlier this year, revealed that physical cleansing reorients goals and shifts priorities. Dong and Lee investigated four different groups ranging from 103 to 242 undergraduate students. The subjects were divided into two categories: those who were given hand wipes and those who were not. Both groups were primed to focus on certain goals by completing word games or short surveys. The results of these four experiments demonstrated that the use of hand wipes made prior goals seem less important than subsequent ones. “This research extends the logic of previous studies showing that physical cleansing can reduce the influence of numerous psychological experiences,” Dong wrote in an email to The Varsity. Physical cleansing detaches traces, such as dirt, from target objects, like hands. This resembles the psychological separation of previous experiences from the present self. Dong and Lee’s research provided evidence supporting this theoretical account in the context of pursuing goals. Their paper, unlike its predecessors, shows “that a bodily experience like cleansing not only activated metaphorically associated concepts like morality, but functions as a highly domain-general procedure.” This means that cleansing is not specific to physical domains, but also influences psychological ones. The research predicts that using hand sanitizers, wipes, or other forms of physical cleansers will ease the switch between tasks that require different mental procedures. “[People] become less influenced by past primes but more influenced by future ones,” Dong said. The study has some limitations, according to Dong. The participants were solely undergraduate students, rather than the general public. The importance of goals was measured immediately after physical cleansing so the short-term nature of the experiment may have also restricted its results. Long-term effects were not examined. Dong, who will join Northwestern University’s Kellogg School of Management as an assistant professor of marketing in September 2017, emphasized that in business settings or organizations, both the managers and employees must often shift between several goals. The sixth annual Mind Matters conference, hosted by U of T’s Buddhism & Psychology Students’ Union in conjunction with the U of T Jungian Society, took place last Saturday morning at Victoria College’s Isabel Bader Theatre. Titled “Altered States,” this year’s event brought a group of reputed scientists and thinkers together to engage in a lively intellectual discussion on the implications of psychedelics in medicine and psychology. The psychology conference, which attracted a full house audience and required almost 40 staff to organize, is the largest of its kind in Canada. Despite the packed house, Ammar Ijaz, one of the many student organizers, described it as a “community” gathering. General admission tickets for the event sold out within six hours of being made available, while the supply of student tickets was exhausted after thirteen minutes. 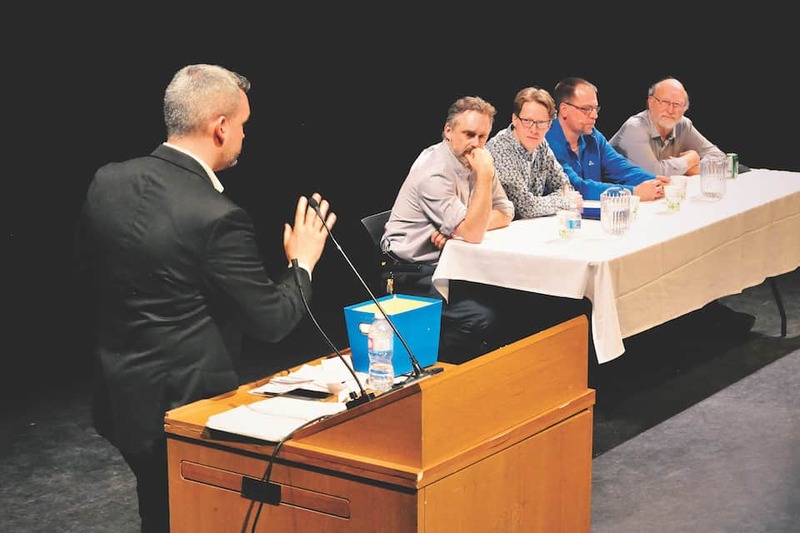 Panelists for the event included Professors Dan Dolderman, John Vervaeke, and Jordan Peterson, all prominent thinkers in the field of psychology. American ethnopharmacologist Dennis McKenna joined the U of T lecturers on stage. The focus of this year’s conference revolved around altered states of consciousness. Topics of discussion included psychedelic medicine, meditation, lucid dreams, trance states, and mystical experiences. The award winning lecturer, Professor Vervaeke, who is a five-time veteran of the conference, opened the conference with an exploration of what he described as the “meaning crisis of modernity.” Vervaeke invoked and interpreted the likes of Friedrich Nietzsche and other philosophers by way of delivering his point, observing a fundamental difference between wisdom and knowledge, ultimately concluding, “knowledge is about overcoming ignorance, wisdom is about overcoming foolishness.” He ended his presentation to a round of applause with an endorsement of the pursuit of altered states of mind for their potential to enhance human understanding and consciousness. By listing a series of everyday interactions with seemingly mundane ideas and objects such as steaks, eggs, the War on Terror, and the economy, Dolderman argued that, “what we experience isn’t exactly the real world. Not experientially but rather simply intellectually.” Steaks do not magically become slabs of meat on our dinner plates. Rather, the reality is the mistreatment of cows. Wars are as connected to freedom and liberty as they are to death, he observed. The event was initially supposed to consist of five speakers with intermissions for coffee, a provided lunch, and an interactive panel discussion. Unfortunately, a slight change of schedule was required since one of the speakers, Lee Maracle, fell ill and was unable to attend. In a post-event interview, an exhausted, but pleased, Ijaz described some of the challenges he faces every year in organizing the conference. “Funding is always a big challenge.” This year, they were able to crowd fund a quarter of the projected conference costs. They were also successful in acquiring sponsorship for subsided student tickets. Editor’s Note (March 10th, 2016): An earlier version of this article misattributed a quote to David Taylor.